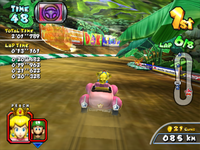 A Black Shell in Mario Kart Arcade GP 2 being detonated against the billboards. 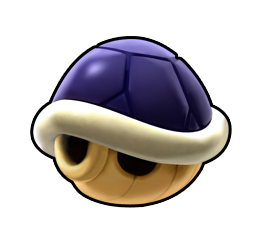 Black Shells are usable items that appear in Mario Kart Arcade GP, Mario Kart Arcade GP 2, and Mario Kart Arcade GP DX. Its effects are similar to that of a Spiny Shell, though unlike a Spiny Shell, it can only be fired straight and has a higher appearance rate. They explode upon impact of a wall, obstacle, or other racer, sending those caught in the blast soaring for a second. They can also be used as a triple if unlocked. This page was last edited on February 18, 2018, at 02:46.